In Part 1 we talked about the ‘why’ and ‘how’ of going undercover to stand in our customers’ shoes. In Part 2 we look at the ‘what’ — the ways we can WOW our prospects by getting creative and discovering ways to set us apart from the competition in our constituents’ minds. As long as you know what your clients and prospects want, and you’re delivering, then you’re good to go. Some folks, like Steve Jobs, are really good at figuring this out intuitively. Most of us, however, must rely on research and good listening skills. Henry Ford didn’t know. 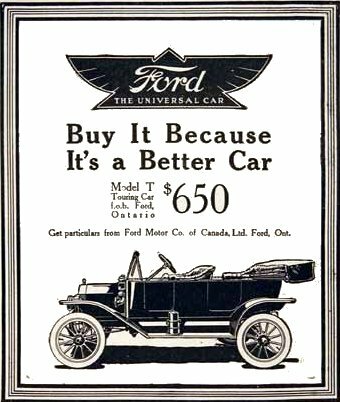 He told everyone they could have one car: a Ford Model T in black. It was cheaper just to make one model. Well, in the long run, it cost him business. Chevy came out with a red car. And folks wanted that so much they didn’t mind paying a little bit extra. What do you have that your constituents want? This is worth really thinking about. Sometimes it’s hidden in plain sight. Mike Lieberman and Eric Keiles recount the story of Disney which asked their staff to think about this question. The housekeeping staff came up with a delightful answer. They put stuffed Mickeys in every room, and positioned the Mickeys doing different things like watching t.v. and taking a shower. Visitors wanted to play, and this was playful and unexpectedly enchanting. What are you doing that enchants? In Little Wows, And Other Ways To Make Your Business Remarkable we learn about the importance of inserting little “wows” into your standard operations. Years ago I attended an Association of Fundraising Professionals (AFP) luncheon (it was called N.S.F.R.E. at the time) where Charlotte Mailliard (now Charlotte M. Schultz and California and San Francisco’s Chief of Protocol) gave a talk about putting on killer special events. Hailing from Texas, she was all about the “wow” (still is!). Her philosophy was one I’ve carried with me ever since: Give your guests more than they anticipate; bestow them with exceptional gifts so they leave fulfilled beyond their expectations. Surprise them. Enchant them. Ask your donors what enchants them. I’ve found that often they’ll tell me they love hearing client stories. Or reading client thank you’s. Or seeing client artwork. Or getting a thank you call that doesn’t ask for another donation. Ask your receptionist what people seem to want more of. Or ask a customer service person. People who engage a lot on the front line know an awful lot about what folks care about. Don’t ignore this valuable resource. Brainstorm possible “wow” opportunities with different groups of staff and/or volunteers. Ask your board members what they hear from their friends about what they’d like to see your organization do more of. Keep asking and don’t rely on what people said they liked in the past. Sometimes what people once found enchanting changes. That’s when you have to change and innovate. Sometimes people are happy campers. That’s when you have to keep them happy and not take away their toys. Remember when Coke tried to mess with the Classic formula? Don’t mess with success (or Texas either, for that matter). But do constantly engage with your constituents so you know what success looks like for them. Don’t guess. Don’t push. Don’t preach. Don’t be Henry Ford. Be Charlotte Schultz. Be Walt Disney. What do you do that makes you stand out from others in your field? These are simple yet effective strategies that can gain and retain customers to continue the business cycle. Thank you for sharing this one.